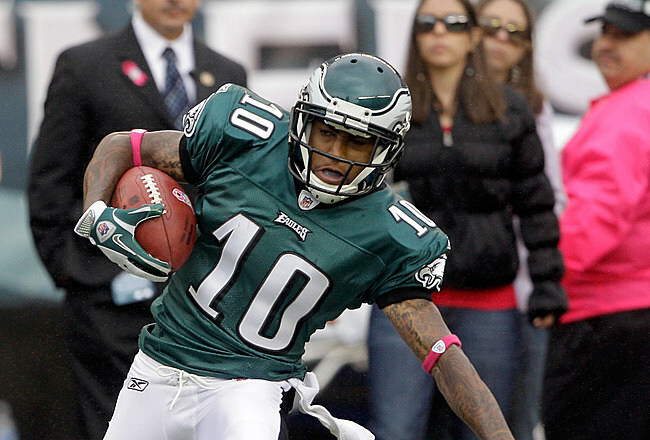 The Eagles on Thursday placed the franchise tag on wide receiver DeSean Jackson. Jackson, a 2008 second-round pick out of Cal, who led Philadelphia with 961 yards receiving last season, was scheduled to become a free agent on March 13. "We want DeSean to be an Eagle for the long haul and this is a step in the right direction to accomplish that," general manager Howie Roseman said. "DeSean is a talented player and a proven playmaker in this league and we look forward to him continuing his career in Philadelphia. "It's our understanding that he has the same desire. We will continue our efforts on getting a long-term deal done with him." Jackson made the Pro Bowl in 2009 and 2010, posting totals of 229 catches, 4,085 yards and 21 touchdowns along the way. Last year, like a lot of Eagles, was a disappointment for Jackson, who caught just four touchdowns as Philadelphia finished 8-8 and out of the NFC playoffs.